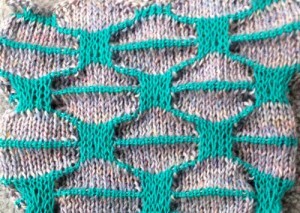 The light color is a 2/8 wool, the green a rayon/nylon blend, thinner in weight; the rayon flattened considerably after steaming (something to consider if maximum texture is the desired aim); the first wide band of green is 32 rows high (full repeat), the narrower stripes occur with changes every 16 rows. 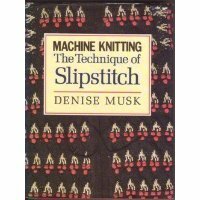 Slip stitch striping can vary a pattern greatly, sometimes more successfully than others. 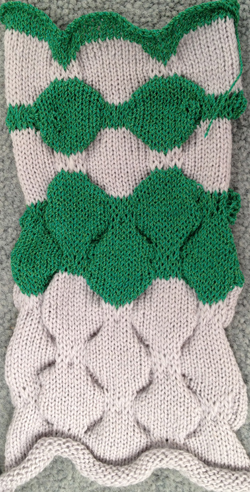 My sample was knit on a 910, using color reverse. 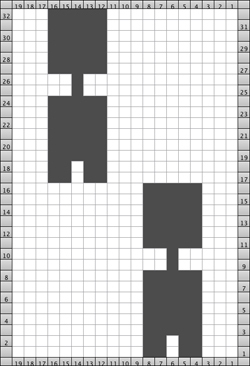 In the first repeat chart the white squares are intended to be what knits, the dark grey the slipped areas (Passap use same repeat, tech 129, each black square is a slipped stitch with lock set to LX rather than KX). 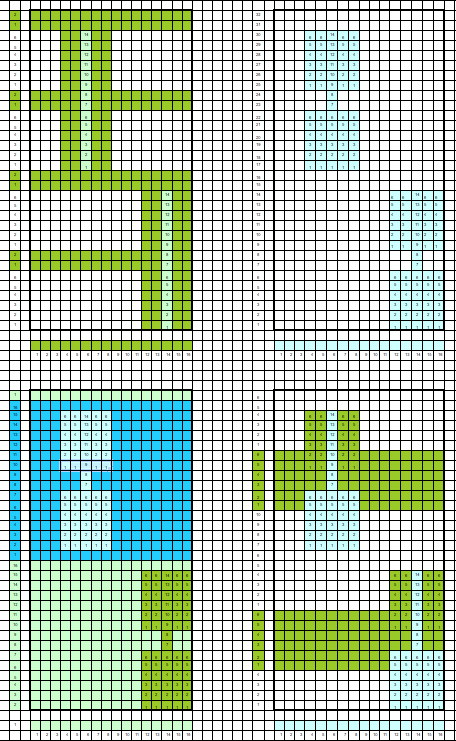 This repeat is too wide as is for use on a punchcard, but were it usable, all but the dark squares would be punched. Obvious color changes may be every 32 rows, every 16, every 8, every 4, 2 followed by 6, and more. The pattern may also be knit with same color rotation, but beginning striping sequences on a different row. 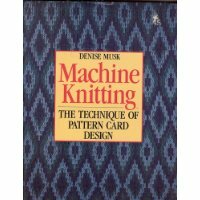 The purl side of this particular pattern helps make it easy to track location of color changes, but with many slip patterns the same may not be so obvious, and good note keeping of sequences and starting rows for the design can be a time saver when one wants to reproduce particular pleasing or successful “random” segments. Those long floats are not very practical because they can get caught by rings etc. when being dressed and the fabric gets destroyed. I appreciate your blog so much! Although a lot of the material is beyond my capabilities at this point, it gives me inspiration for projects in the future. I follow you on pinterest and love your pins.